Hockey Blog In Canada: Happy New Year! 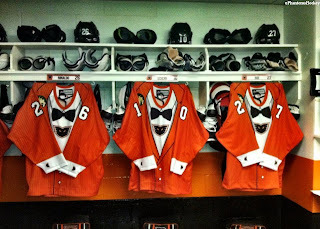 If you caught the Adirondack Phantoms-Bridgeport Sound Tigers game yesterday, you would have seen these incredible orange tuxedo jerseys that the Phantoms wore for their fans. 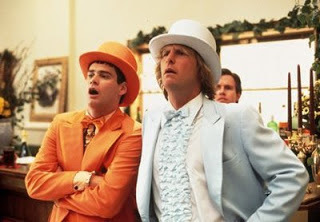 As a promotion, I'm quite satisfied with these jerseys despite the Phantoms looking like they rolled out of Dumb and Dumber. 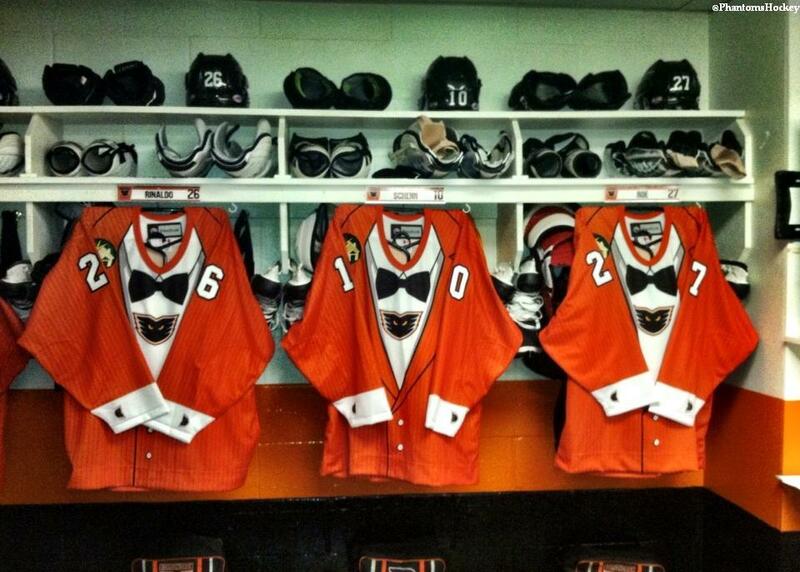 In any case, the Sound Tigers downed the Phantoms in their snazzy tuxedos by a 4-3 shootout score, so 2012 didn't end all that well for the Phantoms. I'm guessing these uniforms may be mothballed after dropping this decision, but it's a fun uniform and I give it a thumbs-up. Canada, on the other hand, saw the Spengler Cup awarded to the team that represented this fine country after they dispatched home team HC Davos by a 7-2 score. Big kudos go out to Patrice Bergeron as he is the only man in Canadian hockey history to have an Olympic gold medal, a World Championship gold medal, a World Junior Championship gold medal, a Stanley Cup ring, and a Spengler Cup gold medal in his possession! Because it's impossible for NHL players to play in the Spengler Cup with their schedules, this makes Bergeron's accomplishment very impressive! Captain Canada, aka Ryan Smyth, would be right there with Bergeron if it weren't for that Stanley Cup eluding him thus far in his career. But Captain Canada has also accomplished everything that a player can do while wearing the maple leaf on his chest. That's pretty special, and I'm happy that Ryan Smyth has always answered the call when Hockey Canada comes looking for players. He's a class act! The other Canadian squad playing in the World Junior Championship is doing quite well. The Canadians knocked off the host Russians by a 4-1 score in Ufa yesterday to capture the top seeding in Pool B, and this will allow them to advance straight through to the semifinals. Canada will play the winner of the Czech Republic-USA quarterfinal game, so there's a chance that two North American teams will have a chance to tangle once more! Finally, I want to wish everyone the best in 2013 as we start a new calendar. This will be my sixth year blogging here, and I cannot thank you enough for stopping by each and every time you've checked in with my ramblings. I've always maintained that my readership is the best, and that will not change. Thanks, readers, for making this game fun!